Six iconic Routemaster buses toured the capital on Wednesday 14 March with students from nine universities on board, including LSBU, as part of the annual London Venture crawl. 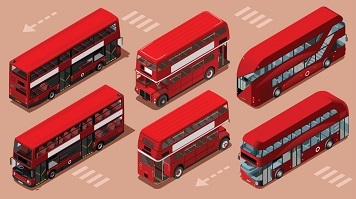 Each bus followed a specially designated route, stopping off for talks, workshops and office tours at a range of global businesses and local workspaces including Deliveroo, Amazon Fashion, Google, Barclays, Hello Fresh, Innovation Warehouse, Digital Capital, Makerversity and Wayra. LSBU students kicked off their leg of the tour in Southwark with breakfast at local food market, Mercato Metropolitano, before boarding the tour bus and travelling to visit property and infrastructure company ‘Lendlease’. Follow up destinations included creative local workspace and social enterprise, ‘Art Works’ and 'Makerversity' – one of Europe's most exciting communities of emergent maker businesses and finally they paid a visit to co-working space, Campus London. Along the route, successful entrepreneurs hopped on board the buses to share their stories and inspire students to pursue their entrepreneurial ambitions. The tour ended with a celebration event at technology innovation centre, Plexal, in the Queen Elizabeth Olympic Park with a keynote speech from Sarah Wood, Founder of technology marketing company, Unruly, and a networking opportunity for all of the participating students. Successfully piloted in 2017 by King’s College London, now in its second year, the Venture Crawl is a unique partnership between nine London universities: Brunel University; King’s College London; University College London (UCL); London South Bank University (LSBU); University of Westminster (UoW); Loughborough University’s London campus; Birkbeck College London; University of East London (UEL) and the London College of Fashion (LCF). Jeremy Shorter, Learning Programme Manager at King’s College London’s Entrepreneurship Institute, said: “The best way to learn about entrepreneurship and innovative thinking is to experience it first hand; to meet the people who are creating new jobs and coming up with creative ways to meet society’s challenges. As London universities we have the world’s top innovators right on our doorstep and we want students to take full advantage of such a unique location. Find out more about the Venture Crawl 2018.